A new organ, the gift of Mr. Eben D. Jordan, was opened in the New England Conservatory of Music, Boston, the latter part of September. This instrument was built by the Hutchings-Votey Organ Company, and contains fifty speaking stops, fifteen on the great, twelve on the swell, eleven on the choir, and twelve on the pedal. There are nineteen pedal movements, combinations, etc., and twenty combination pistons. The action is electric and the consol is placed fifty feet in front of the organ below the stage on the floor of the hall. The pedal board is concave and radiating. The exterior is very elaborate and suggests that of the organ case of Santa Maria della Acala, Sienna, Italy. The case is finished in white and gold. 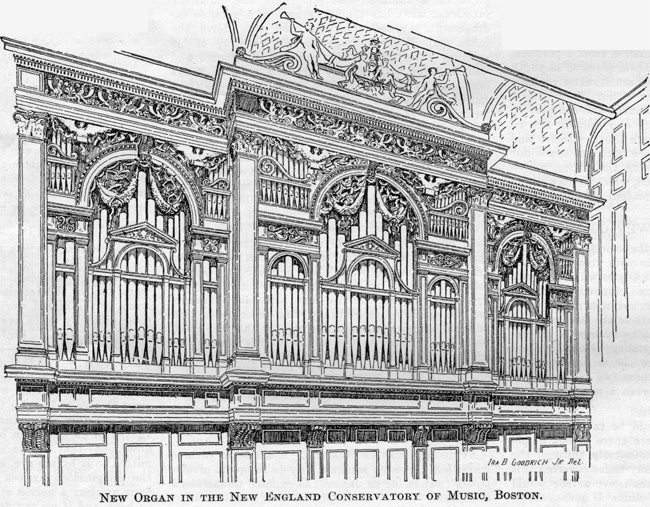 You are reading The Eben D. Jordan Organ in the New England Conservatory of Music from the November, 1903 issue of The Etude Magazine. Theodore Leschetizky is the next entry in The Etude.